The true story of Sgt. Stubby: An American Hero one of perseverance and courage in the face of tremendous, life-changing battles; it’s story that we feel resonates with people everywhere. Every day, many children are engaged in a different life-changing battle: the one against cancer. In the United States alone, nearly 16,000 children are diagnosed with some form of childhood cancer every year. Of those children, an astounding one in five will never be cured. When we learned that only 4% of federal cancer research funding goes towards solving childhood cancers, our hearts broke; tragically, there have been very few advances in treatment since the 1970s. That’s why we’re excited to announce that for the entire month of November, Fun Academy is up with CURE Childhood Cancer in the fight to end this horrific disease. 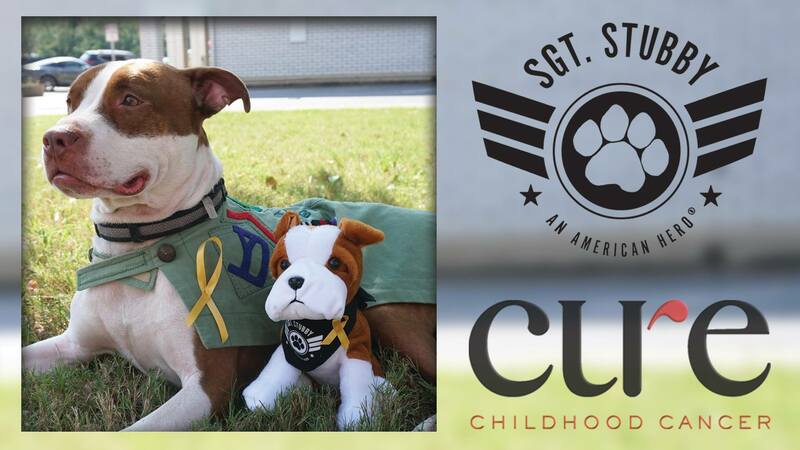 To benefit CURE’s mission, we’ve created a special, limited-edition Sgt. Stubby plush, complete with his own gold Childhood Cancer Awareness ribbon. For every CURE plush purchased, $2.00 will be donated to fund childhood cancer research and treatment; to get your CURE plush and help children today, visit the Stubby Store. We are so proud to share Sgt. Stubby’s fighting spirit with children across the nation, and incredibly thankful to you for all your help.